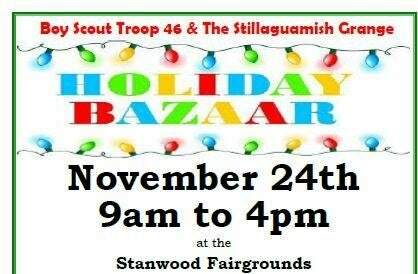 Come check out this awesome holiday fair and craft show hosted by local Boy Scouts troop #46! There will be over 70 vendors and TWO BUILDINGS FULL of things to shop from. Friday night in the Grange will be a ticketed Ladies Night ($5 per person--adults over 21 only) with a naughty santa and wine bar, prizes and goodie bags! Saturday will be the traditional Bazaar and Santa will be there for pictures from 10:00 am - 12:00 pm! Don't miss out on all of this FUN, FOOD and PRIZES! When: Friday and Saturday, November 23rd and 24th, 2018 from 9:00 am - 4:00 pm.